One of CEF’s newest partners, Winds of Change, is returned recently to complete its project in Pedro Arauz - a small community of approximately 80 families that is located in rural Nicaragua. While Winds of Change has been developing a relationship with this community for some time, this is CEF’s first opportunity to learn about its environment and people - to evaluate its needs, and to assess the impact of this project on its peoples’ quality of life. Since the project’s inception, Winds of Change has already built one windmill, two irrigation systems and supported the rehabilitation of a local school. The work in February includes installing two additional irrigation systems, as well as multiple water purification systems meant to address the growing incidence of diarrhea and kidney disease among local children and adults. 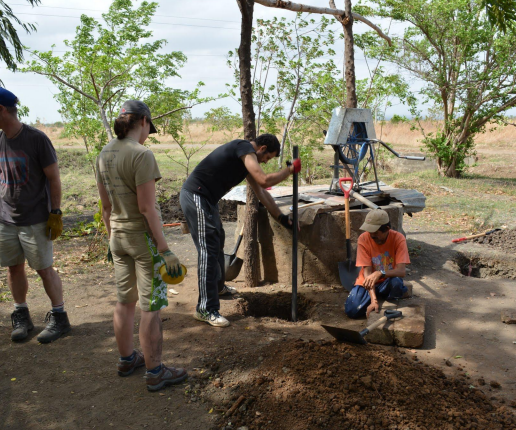 Bringing together a team of well-respected engineers, business leaders, professors and University of Toronto students, Winds of Change is a Canadian non-profit organization that strives to promote water security in rural Nicaragua. The flagship project of the organization and its leadership team is the design and construction of windmills and irrigation systems using locally sourced material and labour; however, Winds of Change also supports education and capacity building through a range of initiatives. The latter is also a testament to the organization’s diverse constituency, which is a reflection of interests ranging from the public and private sectors, all the way to academia. To those of us that have ready access to clean drinking water at all times of the day or night, it is undoubtedly easy to take for granted the efforts required by some to find and transport clean water to and from their homes. Although wells remain a lifeline to many communities around the world, windmills can facilitate access to potable water in larger quantity - not only for drinking, cooking and cleaning purposes, but also for harvesting crops which requires a degree of consistency. Sound irrigation systems are equally important to (a) maximize crop yield, and (b) minimize water usage; and agricultural education allows communities to harvest crops that are otherwise implausible to grow because of poor soil conditions, or a lack of knowledge. For Winds of Change, it is incredibly important to enable individuals and families to create lasting change from within their communities through skill development and the implementation of lasting low-cost technologies. This allows local communities to become self-sufficient in the long-run, and promotes capacity, health, social solidarity and network building. It also facilities commerce in and between communities by supporting access to local food markets where crops can be bought and sold. Through the continued interaction with community leaders Winds of Change plans to develop projects within Pedro Arauz and surrounding communities to provide new and exciting opportunities. The longer-term impact of these projects and ongoing education / training is to allow families to remain as a unit longer, achieve higher levels of education among children, and provide predictable and sustainable access to the basic necessities of life.